The Winter Olympics and Paralympics may have now come to an end but 2018 still has plenty of sporting action to get excited about. Tomorrow sees the Commonwealth Games get underway with a whole host of British athletes hoping to get their hands-on medals in 26 different sports. These include everything from traditional events such as swimming and cycling, to niche events including lawn bowls. 71 nations will be participating at the event which sees countries and territories throughout the Commonwealth come together for a wonderful sporting celebration. Formerly known as the British Empire Games , the first event took place in Hamilton, Canada in 1930 and just like with other sporting events, now takes place every four years. Over the years the event was given many names but has been known as the Commonwealth Games since 1978 when the event again was in Canada, in Edmonton. Here at Champions Olympic Speakers we provide a rundown of what to expect from the 2018 edition of the Games. The games are being hosted in the Gold Coast, Australia and an expected 35,000 people are set to attend. This year sees the event head down under as Australia’s exceptional Gold Coast host the Games. Fighting off competition from Sri Lanka, the Gold Coast is located in Queensland and will see athletes competing in the stunning Australian sunshine. The highlight of any large-scale sporting event is the athletics and this year the track and field athletes will star at the Carrara Stadium . The venue is normally home to the Australian Rules football team Gold Coast Suns and will see 35,000 people pack into the stadium to witness this, as well as the opening and closing ceremonies. The Gold Coast’s athlete’s village will be home to over 6,000 athletes during the Games with most venues all located within 20 minutes of the village meaning there will not be far to travel. The Commonwealth Games is renowned for being one of the few sporting events where the home nations compete separately rather than as Great Britain is the case at the Olympics and Paralympics. This means England, Wales, Scotland and Northern Ireland athletes will all be competing separately. Apart from Northern Ireland, the other three home nations along with Australia, Canada and New Zealand are the only countries in the world who have competed at every single Games. England will be hoping to better their tally from the 2014 Games in Glasgow where they won 174 medals, topping the medal table in what was their best ever total. Overall England have won 2,010 medals at the Games placing them second on the all-time medal behind Australia. The hosts have also been the highest scoring nation in ten separate Games, more than any other country and are sure to be strong in the Gold Coast. Due to nations in the Commonwealth competing, this also gives athletes from islands such as Jersey, Guernsey and Norfolk Island to represent these territories on a big stage. Perhaps the biggest name at the Games is two-time Olympic champion triathlete, Alistair Brownlee MBE. The star also won two Commonwealth Games gold medals in 2014 in both the men’s race and mixed team relay. As well as competing in the Gold Coast, Alistair will have the honour of leading out the English team as flag bearer. The 29-year-old will lead out the 390 team at the opening ceremony tomorrow and is expected to do well in the triathlon events. For Wales, swimmer Jazz Carlin will be flagbearer at what is her fourth Commonwealth Games. A silver medallist in Rio at the Olympics two years ago and will be amongst the favourites to defend her 800m freestyle title in the pool. 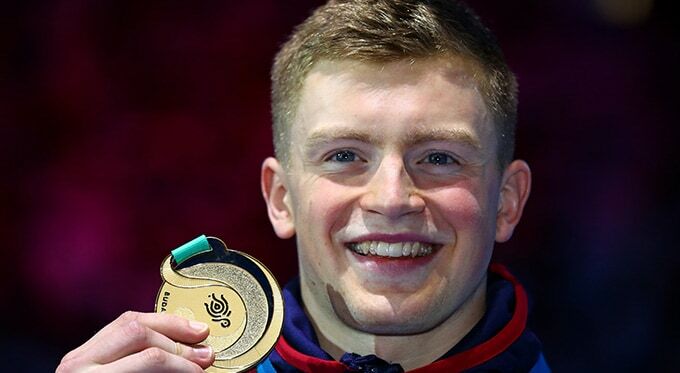 Adam Peaty MBE is another swimmer who will be hoping to medal in Australia, following the two golds he picked up in Glasgow four years ago. For Scotland, track and field athlete Eilidh Doyle will be carrying the St Andrew’s cross at the opening ceremony and the record breaker will be amongst the favourites in the 400m hurdles event. Jamaica’s Elaine Thompson made history in 2016 when she became the first woman to win gold in the 100m and 200m events at the same Olympics since 1988. She will be hoping to win her first Commonwealth Games medal this year. Another point of interest will be the 100m race. Now Usain Bolt has retired, the likes of Yohan Blake, Adam Gemili and Trae Williams will all be hoping they can pick up the mantle. Someone else to look out for is Welsh table-tennis player Anna Hursey. At just 11 years old she becomes the youngest competitor to ever represent Wales. This year the Commonwealth Games takes place between 4 – 15 April and here at Champions Olympic Speakers we will be keeping up-to-date with all the latest from the Gold Coast. As well as this, if you would like to book any of our fantastic Olympic speakers for your next event, get in touch by calling 01509 85 29 27 or complete our online form and a member of our team will get back to you.